Are you looking for the best car GPS device? Check out our top pick up and buying guide below. Today’s mobile devices integrate talented and a lot of times, free navigation apps, but not everyone wants to use a smartphone or a tablet for driving directions. With a standalone GPS, you can just leave it in a car and forget about it, until, of course, you are lost in an unfamiliar place. Or you are on a road trip, it’s late night, or you want to avoid sitting in hours of traffic. With goodies like lifetime map updates, local search and free traffic reporting now commonplace, today’s GPS devices do a lot more than they ever have, and they have never been more affordable, thanks in part to stiff competition from those aforementioned nav-enabled smartphones and tablets. Nowadays the car GPS system is a must. There’re many reasons as to why you would end up using a separate GPS unit and not your smartphone. Any GPS application such as Google Maps, Waze GPS Device or Apple Maps, will end up eating up so much more battery, date and will bog down the performance of your phone during the whole process. While convenient this proves to be a frustrating thing in some cases, making you wish that there was a dedicated GPS navigation system. GPS manufacturers with millions of real-world test miles and with years of experience now offer an advanced driver assistance features, geo-based recommendations, voice commands, Bluetooth connectivity and much more on a large HD display. Further for many smartphone users, day-to-day life includes watching their weekly/monthly data allotment dwindle, but modern GPS unit operates independently of Wi-Fi and your data plan. If you are looking for a way to make all this travel more manageable, you will probably love using a proper navigation system. And a navigation system for your car can help you to optimize your route for better driving, travel safely and avoid traffic. Whether you are upgrading your older car with new technology or just looking for a high-quality navigation partner, our list of best in-car GPS devices is sure to have something to meet your needs. Simply plug yours into a cigarette lighter, adjust your settings, enter your desired destination and you are ready to go. 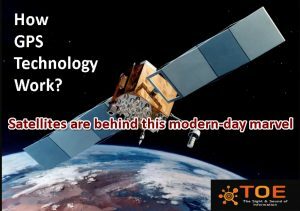 Check out: How GPS Technology Work? Complete with a built-in dash cam, the Garmin nuviCam LMTHD offers an incredible overall user experience and comes with great features to help you drive safer. A built-in dash cam continuously records your drive, nüviCam LMTHD takes GPS auto navigation to a whole new level, plus features that enhance driver awareness. The device comes with a magnetic windshield mount which automatically charges your navigation system. Want to take a closer look at your route? The high-resolution 6-inch glass display on your nüviCam LMTHD offers pinch-to-zoom capability. The product design also features a powered magnetic mount that securely charges and holds nüviCam as you drive. nüviCam LMTHD comes preloaded with detailed maps of North America. With free lifetime updates of a map, your routes are sure to reflect the most up-to-date maps, navigation information and points of interest(POI) available. New maps are available for download for the useful life of your GPS device — no subscriptions; no fees. Offering the protection of “an eyewitness that never blinks,” Garmin nüviCam LMTHD comes with a built-in, high-definition dash cam that records while you drive. If a collision occurs, the G-sensor(device’s incident detection) will automatically save files on impact. GPS records exactly when and where events occurred. And the device’s swivel lens lets you adjust nüviCam’s camera angle for better recording from your device windshield or dashboard mounting location. Also, you can play back the video on your large, 6-inch display — and even view an exact map of where you were, at the time of the incident. And you can even watch the video later on your computer using Dash Cam Player. There is also a Snapshot feature on the nüviCam LMTHD that allows you to capture still images — you can even remove the unit from your car(vehicle) to take pictures of any collision damage. A microSD card is included with your device for storage of your recorded video data. Thanks to Garmin Real Vision(GRV), hard-to-read house numbers are a thing of the past. Now when approaching select destinations, your nüviCam display will switch to camera view and an arrow( usually bright in color) will point to where you want to go. 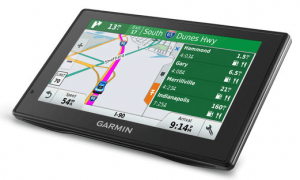 Garmin nüviCam LMTHD offers you the option of convenient voice-activated navigation. Speak, and your device intelligently responds, while your hands can remain safely on the wheel. Sync a Bluetooth enabled device, like a smartphone, to your nüviCam LMTHD for hands-free calling through its integrated microphone. Safely stow your phone in a protection box, purse or pocket and still dial, answer and take calls without moving your eyes from the road or your hands from the steering wheel. Smartphone Link is a free mobile app that connects nüviCam LMTHD with your compatible iPhone or Android smartphone. When paired, your nüviCam can use your phone’s existing data plan to share information — such as where you parked, your destination and point of interests. With the Smartphone Link app, you can send addresses and locations from your phone straight to your nüviCam LMTHD. Smartphone Link also gives you access to useful real-time information(such as weather) and Garmin Live Services too. Direct Access simplifies navigating select complex destinations, like shopping malls and airports, by finding a place within a larger location. When navigating to the mall, Direct Access gives you additional location information for specific retail stores inside (for example, “Arriving at Woodfield Mall. Anthropologie is inside on the upper level. etc.”). Direct Access even navigates through parking lots to find an entrance nearest your destination. Good driving is a cautious driving. Especially when children are around. To help, your nüviCam issues an audible alert and displays an onscreen warning whenever you approach a school zone. The displayed speed limit also changes to reflect the school zone speed limit. 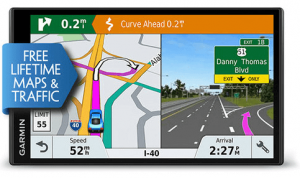 Garmin nüviCam LMTHD keeps your driving map onscreen at all times, and additional information appears alongside. For details, touch the screen. As you drive your route, and Up Ahead constantly informs you of nearby services, including food, fuel, and ATMs. Other good-to-know information, displayed on your nüviCam LMTHD, includes speed limit, current speed, current street and arrival time at your destination. For a complete navigation solution, nüviCam LMTHD pairs with the BC™ 30 wireless backup camera (sold separately. Professional installation recommended). Once connected, you can easily see vehicles, pedestrians, and other obstacles right on the nüviCam display, as you move in reverse. 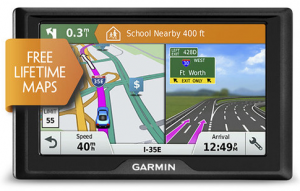 Enjoy turn-by-turn directions throughout North America, a 6-inch pinch-to-zoom screen, and hands-free calling with the Garmin DriveSmart 60 LMT Navigation System, comes with numerous features to make driving more comfortable for you, including easy-to-understand directions using landmarks and businesses, alerts for road hazards (or your own fatigue), directions within complex locations like malls and airport parking lots, and comprehensive search. Also can sync a Bluetooth-enabled device, such as your smartphone, for receiving smart notifications, hands-free calling, calendar reminders, and text messages without taking your hands off the wheel. You can also get directions by talking to Garmin DriveSmart instead of touching, thanks to its voice-activated navigation capability. Along with map data, the DriveSmart 60LMT is populated with information from Foursquare on millions of destinations(local destinations) and points of interest. You can also customize your device with up to 1,000 destinations of your choosing. Active lane assists with voice command and junction view ensure that you’re in the right lane of travel, while route shaping helps to pick the most efficient way to get where you are going. The system is compatible with backseat cameras and user-supplied Garmin backup. Garmin DriveSmart 60 LMT GPS navigator provides driver alerts and increases situational awareness to encourage safer driving. Warnings include alerts for sharp curves, railroad crossings, animal crossings, speed changes and more. Additionally, Garmin DriveSmart 60 LMT notifies you when driving the wrong way on a one-way street and also sends warnings for nearby school zones. Receive alerts for speed cameras and nearby red light and be prepared for sudden halts in traffic with upcoming traffic jam alerts. For longer drives, a fatigue warning suggests break times and potential rest areas after hours of driving. Up Ahead feature lets you easily see places up ahead and milestones along your way, without leaving the map view. Synch a Bluetooth-enabled device, such as your smartphone, for hands-free calling and calendar reminders and receive text messages without taking your hands off the wheel. Customizable smart notifications appear on the navigation display. DriveSmart 60 is capable of searching millions of locations and providing exact directions by entering a term (like “pizza”), the full address of a business or name. Improve your view while backing up and keep tabs on back seat passengers without turning your head with babyCam backseat camera and Garmin’s BC 30 backup camera, both sold separately. Images from the cameras show on demand on the DriveSmart’s display. 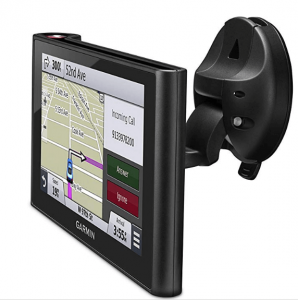 Garmin DriveSmart 60 NA offers you the option of convenient voice-activated navigation. Control your Garmin DriveSmart with a voice, while your hands remain safely on the wheel. Sync a Bluetooth-enabled device, such as a smartphone, to Garmin DriveSmart NA 60 for receiving smart notifications on your Garmin DriveSmart display and for hands-free calling. Receive calls, calendar reminders and text messages without ever removing your hands from the steering wheel. Stay focused on your drive ahead while staying connected with customizable smart notifications that conveniently appear right on your navigation display. Active Lane Guidance(ALG) with voice prompts prepares you to drive through interchange or an exit with confidence. As you approach, an animated model uses arrows(usually brightly colored) to indicate the proper lane needed for your route. PhotoReal Junction View realistically displays interchanges and junctions along your route, including the surrounding landscape. And, Bird’s Eye junction view offers a detailed view of interchanges, looking down as if from overhead. Garmin Lifetime Traffic feature can give details about the situation, such as how many minutes of delay to expect and if there’re any possible detours. It can even confirm whether or not you’re on the fastest route. Lifetime traffic entitles your Garmin DriveSmart 60 to receive free traffic alerts for its useful life, with no subscription fees and no ads. Garmin Traffic information is delivered straight to your Garmin DriveSmart — no smartphone needed. Garmin DriveSmart 60 redefines “spoken turn-by-turn directions” with Garmin Real Directions, you will get easy-to-understand driving directions that guide you like a friend, using recognizable buildings, landmarks and traffic lights (e.g., “Turn left after the QT” or “Turn right after the red building”). It’s preloaded with millions more popular and new places, thanks to Foursquare. The TomTom VIA 1605TM is a top-notch budget GPS device, thanks to its sharp 6-inch screen, solid feature set, and fair price. Still not convinced smart-phones are as good as GPS devices? You are not alone. The TomTom VIA 1605TM features the largest screen TomTom has ever used for a GPS device 6 inches, and it’s sharp. And now Magellan has been rocking 7-Inch panels on its RV-focused RoadMate series for a while. But most of those devices are much heavier and larger. Apart from the compelling design, the TomTom VIA 1605TM Best Price at Amazon is a solid performer with a newly refined user interface and accurate routing. Combined with an affordable price, this makes it our new Editors’ Choice for budget stand-alone GPS devices. Enjoy spoken turn-by-turn directions throughout the US and a 5-inch color touchscreen display with the Garmin Drive 51 LM Navigation System. Along with free lifetime map updates, this system comes with numerous features to make driving safer and more comfortable. Garmin Drive 51 comes with TripAdvisor points of interest(POI) such as hotels, attractions, and restaurants near your destination and along the way, and info from Foursquare on millions of local destinations. Further, you can also customize the device with up to 1000 destinations of your choosing. Junction view and lane assist ensure that you’re in the right lane of travel, while route shaping helps you pick the most efficient way to get where you are going. The system is compatible with user-supplied Garmin smartwatches and backup cameras. As you drive, you can glimpse at the Garmin DriveLuxe 51 to see navigation info such as nearby upcoming turns, landmarks or lane changes as well as the current speed limit. You can view incoming traffic alerts if you pair your smartphone to the device via Bluetooth such as those for construction, traffic cameras or accidents – through the companion mobile app. It can even help you find parking or allow you to share your location with your friends. Pairing your smartphone to the DriveLuxe 51 also means that you can read a text message, view calendar notifications or see incoming calls at a glance while keeping your hands on the wheel. Also has a microSD slot in case if you want to download additional maps for other regions. Sharp curves, speed limit changes, school zones, railroad crossings, and animal crossings. Fatigue alerts and rest area suggestions. Wrong-way warning on one-way roads. Red-light and speed camera warnings in jurisdictions where permitted. Uses recognizable landmarks, intersections, and buildings to let you know when and where to turn. TripAdvisor info on hotels, restaurants, and attractions on your journey and your destination. Foursquare info on millions of restaurants, shops, entertainment venues, and other points of interest. Pair with a user-supplied backup camera for dramatically improved safety. Displays current street, speed limit, current speed, and arrival time. Route shaping through preferred cities/streets. Lifetime U.S. map and traffic updates. Up Ahead feature with milestones. The quality of map data can make all the difference between finding your destination and getting lost. High-quality HERE map data enables your device(Garmin Device) to provide you with the info you need, when you need it most — reducing the frustrations of driving by avoiding delays and cutting down the time you spend in your car. Enjoy spoken turn-by-turn directions throughout North America, a 7-inch pinch-to-zoom screen, parking info and live traffic updates, and hands-free calling with the DriveSmart 61 LMT-S Navigation System by Garmin. This system comes with numerous features to make driving more comfortable and safer, including alerts for Road hazards (or your fatigue), easy-to-understand directions using businesses and landmarks, and routes within complex locations like mall and airports parking lots. Sync a Bluetooth-enabled device, such as your phone/smartphone, for hands-free calling, text messages, receiving smart notifications, and calendar reminders without taking your hands off the wheel. Also, you can get directions by talking instead of touching, thanks to Garmin for the unit’s voice-activated navigation capability. When a software or map update is available, you will be notified, and the DriveSmart will download the update automatically for you using your home WiFi network. Along with map data, this navigator is populated with TripAdvisor points of interest(POT) such as restaurants, hotels, and attractions near your destination and along the way, and info from Foursquare on millions of local destinations. Also, you can customize the device with up to one thousand destinations of your choosing. Junction view and active lane assist with voice prompt ensure that you’re in the right lane of travel at tricky interchanges, and route shaping helps you pick the most efficient way to get where you are going. The system is compatible with BC30 Wireless Backup Camera and the Garmin smartwatches; both sold separately. Pair the navigator with your compatible smartphone using the free Smartphone Link app, and you will have traffic alerts, relevant rerouting suggestions, availability trends for on-street public parking, and pricing for parking facilities. The app also enables LiveTrack, which lets you share your exact location with family or friends. The DriveSmart will alert you to speed limit changes, sharp curves, animal crossings, school zones, railroad crossings, and will warn you if you end up going the wrong way on a one-way road, or if you have been driving for too long without a break. In jurisdictions where it’s permitted, it’ll warn you about red-light and speed cameras. Synch a Bluetooth-enabled device, such as your smartphone, for hands-free calling, calendar reminders and receive text messages without taking your hands off the wheel. Customizable smart notifications appear on the navigation display. Garmin’s Real Directions feature uses recognizable landmarks, intersections, and buildings to let you know when and where to turn. The DriveSmart provides info from TripAdvisor on restaurants, hotels, and attractions on your journey and your destination, along with Foursquare data on millions of entertainment venues, restaurants, shops and other points of interest. Pair this device with compatible Garmin smartwatches for driver alerts on your wrist and compass guidance to find your vehicle, and with Garmin’s BC 30 Backup Camera for dramatically improved safety (backup camera and smartwatches sold separately). Active lane guidance with voice prompts. You might be interested in : Best Dashboard Camera for your car. Unless money is no object, it is a good idea to start off by setting a general price range. If you are looking to spend less than a hundred dollars, you are probably going to scrimp a little on the features and have to settle for a small screen. You can also look for a bargain on an old model, but make sure that you do not end up with outdated maps that are impossible to update or either costly. Your budget will also inform your decision to go for an integrated GPS or a standalone device. Head units that include built-in GPS navigation are usually quite expensive, so you may want to drive away from them unless your existing head unit is begging for an upgrade. In such a case, there are some head units, which include integrated GPS navigation that can boast some pretty impressive features. Screen size and resolution – Though larger screens are more accessible to see at a glance, which is important since you do not have to take your eyes off the road too much. Here resolution is also important since low-resolution images can be tough to read at a distance. Audible directions – Text-to-speech, or spoken direction is tremendously important from a safety perspective. Most of GPS unit offer this, but some are difficult to understand. And you absolutely want to be able to understand your GPS unit from a safety perspective first. Type of receiver – This is not an exciting feature, but the overall quality of a GPS is highly depended on how well its receiver works. If a GPS unit has poor sensitivity, it would not accurately show the position of your vehicle on the road. Automatic routing – Automatic routing will automatically recalculate your route if you deviate from it. This feature is extremely important since reality includes things like accidents and construction that you may need to drive around. Traffic – Some of GPS units and apps are capable of displaying traffic data also, which can help you gets where you are going without getting stuck in traffic jams. 3D map view – This feature allows you to view a 3D map of the location, which can help you orientate yourself in different/unfamiliar place. Lane assist – This feature shows some infographic every time you approach interchange or an exit on a freeway. This is tremendously useful when driving in an unfamiliar place/area since it can help you avoid dangerously late lane changes. Points of interest – This feature is useful on road trips, and when driving in an unfamiliar place, since it can help you locate restaurants, gas stations, motels, parks, rest stops, and other local businesses and landmarks. Voice input – Some GPS units and apps allow you to set your route, and make alterations, with your voice command. This is useful if you do not have a co-pilot and need to make changes to your route on the fly. Before you buy a GPS unit for your car, you should also look into availability and timeliness of map updates. This is important especially if you are buying a discounted unit that is a little long in the tooth. While it is possible to find some incredible deals by shopping for old stock and factory refurbished car GPS units, it is vital to make sure that you do not get stuck with old map data. If the map updates are expensive — or the company is not putting out updates anymore — then it might be wise to take a pass. The (GPS) Global Positioning System is a technical marvel made possible by a group of satellites rotating in Earth’s orbit. It transmits precise signals, allowing GPS receivers to calculate and display accurate location, time information to the user and speed. GPS is owned by the U.S.
By capturing the signals from satellites, Global Positioning System receivers can use the mathematical principle of trilateration to pinpoint your current location. With the addition of computing power and data stored in memory such as points of interest, topographic information, road maps, and much more, GPS receivers can convert speed, location, and time information into a useful display format. GPS was created by the U.S Department of Defense (DOD) as a military application. This system has been active since the early 1980s and began to become useful to civilian people in the late 1990s with the advent of devices used by people that support it. Consumer Global Positioning System has since become a multi-billion dollar industry with a wide array of services, products, and internet-based utilities. As with most technology, its development is ongoing; while it is a true modern marvel, engineers recognize its limitations and continuously working to overcome them. In all weather conditions, GPS works accurately, around the clock, and all around the globe. There are no subscription charges to use GPS signals. GPS receivers generally work well within 15 meters, and newer models that use (WAAS) Wide Area Augmentation System signals are accurate within 3 meters. GPS signals may be blocked by skyscrapers, dense forest, canyon walls, walls, bridges, and the like, making accurate GPS navigation difficult or impossible. Likewise, GPS does not work well in indoor and underground spaces. Radio interference, satellite maintenance, and solar storms can cause coverage gaps. The United State.-owned And -operated GPS is the world’s most widely used space-based satellite navigation system, but Russian GLONASS satellite constellation also provides such global service. Some consumer GPS devices use both systems to increase the likelihood of capturing sufficient position data and improvement of accuracy. GPS systems work in 5 simple steps. To trilateration, a GPS receiver measures the distance through the travel time of radio signals. Along with distance, GPS can locate the exact position of the satellites in space. GPS uses very accurate timing to measure the travel time. Finally, this system can correct for any delays that signal experiences as it travels throughout the atmosphere. Trilateration Principle is used to find the exact location of something or someone. It compares a person’s exact location from three or more places to determine a person’s exact location. Let us say there is a GPS unit located 600 miles away from Minneapolis. This means that it must be some point on a circle with a 600-mile radius around Minneapolis. If it is also 450-miles away from Boise, the GPS unit must be located at one of the two points where these two circles intersect. If we add a third measurement, like 700-miles from Tucson, we find that the three circles intersect in Denver. The GPS unit is therefore located in Denver. Civilian GPS uses one frequency, while the military uses two frequencies. This increases accuracy. Dual-frequency GPS devices are available to civilians, but their size and cost make them impractical. The United State’s government is engaged in an ongoing, modernization program and multibillion-dollar improvement. U.S. taxpayers fund the world’s GPS services, through the Department of Defense. The 2017 budget was about 900 million dollars. An American joint military/civil body, the National Executive Committee for Space-Based Positioning, Timing, and Navigation oversees the GPS. The U.S. Air Force maintains and operates it. As of 2017, 24 GPS satellites circle the Earth. GPS is essential to devices, services, conveniences we take for granted every day, such as cell phones, computers, watches, weather forecasting, navigation, energy delivery, and emergency/disaster response. GPS is crucial to national security. All new military equipment is GPS-equipped. Industries from banking, aviation, construction, and shipping to financial markets, farming, and so many more rely on the accuracy of GPS. GPS informs the world’s sea, air, and road transportation systems.